Difference between revisions of "BZFlag (game client)"
# If the player is carrying a flag, a [http://bzflag.org/documentation/flags flag ID] will show separated by a forward slash. The colour of each player's scoreboard entry shows to which team the player currently belongs. The users listed at the bottom are [[Observer_Mode|observers]] (could be waiting to join, or just... observing) and have no tank in play in the game. Observers can interact textually; they can send player or team [[message|messages]] and can issue [[Slash_Commands|server commands]] as permitted by their [[Global_Registration#Callsign_Markers|status]]. The colour of each player's scoreboard entry shows to which team the player currently belongs. The users listed at the bottom are observers (could be waiting to join, or just... observing) and have no tank in play in the game. Observers can interact textually; they can send player or team [[message|messages]] and can issue [[Slash_Commands|server commands]] as permitted by their [[Global_Registration#Callsign_Markers|status]]. This article is about the BZFlag game client. The game client is designed to allow players to join game servers and play on the world files. This is not possible with BZAdmin as this only allows administration and messaging and has a command line interface. Some of the features in the BZFlag game client which are not provided in BZAdmin and BZFS are listed below. More details about these features are provided below. Once the game client is started there's five options which are provided to users when initially started. The options are listed below. The options in the Join Game section are listed below. 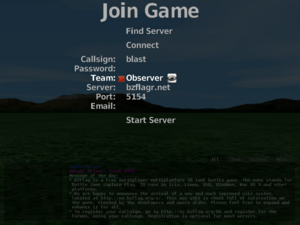 Find Server Search for game servers. Connect Connect to the selected server if permitted. Callsign The callsign a player would like to use. Password The password a player uses to register their callsign with. Team The team a player would like to join if permitted. Server The server a player would like to join. Port The port a player would like to join to. Motto A custom message which is displayed next to a players callsign. Start Server Start a locally run server from the game client with limited options. The options in the Options section are listed below. Input Settings The settings used for input in the game client. Audio Settings Audio settings and options. Display Settings The settings used to adjust the display from the game client. GUI Settings The settings used in the game client interface. Effects Settings The settings used to adjust effects like spawns and gm shots. Cache Settings Settings to save the server list for some time. Save Settings Save the settings a user would like to have. Save identity The settings used to determine if the client should save the users identity. Save World Save a world file which a specific name. Save Settings Save the settings currently used. The radar is the box to the bottom-left of the BZFlag GUI. It gives one a 360 degree, zoomable view around ones tank. An example of a full size, fully transparent radar panel. It is zoomed in at the default "1" setting. The heads up display (HUD) is located on the users screen when they are playing as a tank which gives them information. Heading - Along the top of the HUD is the heading (in degrees). Altitude - Altitude (in meters) is displayed along the right side of the heads up display. 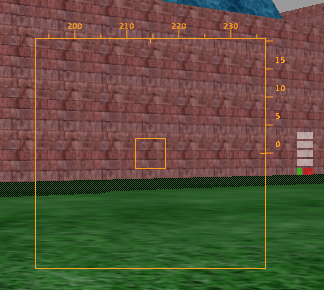 Aim - The aim box can be seen in the center of the HUD which shows where the shot will go after firing (not dynamic). Score of the player (kills - deaths). Number of times the player has made a kill on an enemy tank. Number of times the player had been killed. The number in square brackets shows the number of teammates the player has killed. The number of times you have killed that player. The number of times that player has killed you. The callsign registration status is denoted by (<blank>, "+", "-" or "@") and is described here. The callsign of the player. In brackets is the email address of the player, which only shows if not blank. This is sometimes set to the team of the player if they are in a league. Players often use the field for humourous comments (take care that rude or offensive content can earn you attention from the server administrator). 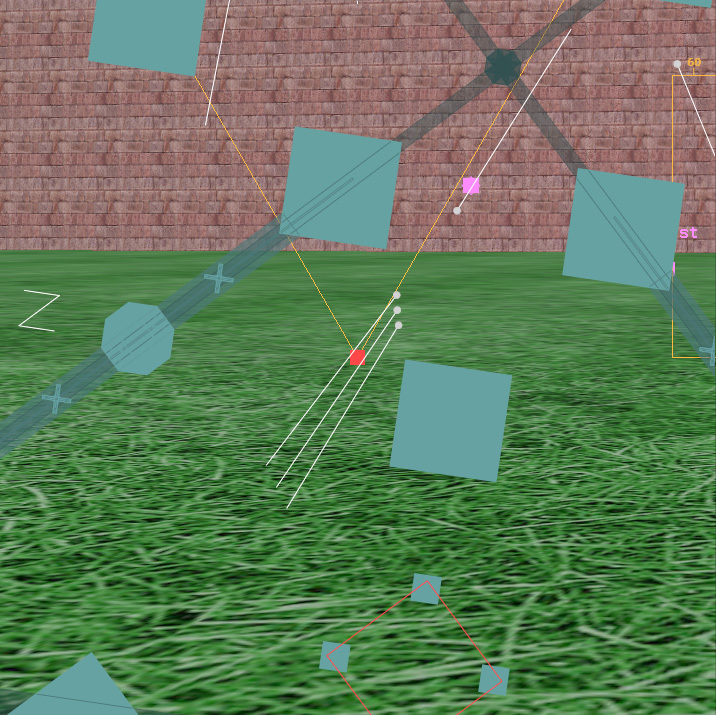 If the player is carrying a flag, a flag ID will show separated by a forward slash. The colour of each player's scoreboard entry shows to which team the player currently belongs. The users listed at the bottom are observers (could be waiting to join, or just... observing) and have no tank in play in the game. Observers can interact textually; they can send player or team messages and can issue server commands as permitted by their status. The total score of the team (wins - losses). The number of times players on the team have killed other players. The number of times players on the team been killed. The number of players on the team. The image shows 4 purples, 3 greens, 2 reds and 3 blues. Note that rogues and observers do not show here because neither is a team, in the BZFlag sense. The observer mode can be used to watch other players or team flags. It can also be used to freely roam around the map. L Display a label just under each tank listing their name. Arrow Keys Navigates the camera around with tank-driving style controls. Ctrl+Arrow Keys Pans and tilts the camera without moving the position. Shift+Arrow Keys Moves the camera position up and down vertically, and left and right horizontally. Alt+Arrow Keys Strafe side to side. F6/F7 Previous/Next target in the current display mode. Does not have any effect in the roaming mode. F8 Cycles through various observer modes: roaming, driving with a tank, following a tank, tracking a tank, and tracking a team flag. A Toggles momentum on the camera movement. This is an extra command for use in roaming mode that enables you to define the camera position and rotation. The /forceradar command was added in v2.0.16. It allows observers to see the radar on "no-radar" worlds. Mouse observer controls were added in v2.0.16. By using various combinations of the left/middle/right mouse buttons, you can change the location and orientation of your viewpoint. You can also change the observer mode and target using the mouse wheel. The 'Extended Observer Info' option found in Options->GUI Settings was added in v2.0.16. It allows the observing player to get more detailed information about the player they are currently following or tracking. Player tank speeds show up by their names on the scoreboard while some more detailed stats show up in the upper right corner. In addition, tank speeds also appear below player names if Tank Labels are enabled.